GPRS offers in-depth infrared imaging and thermal heat detection services. Our highly trained professionals go beyond the surface to evaluate underground radiant heat pipe structures and provide detection of radiant heating tubes prior to cutting or drilling. When thermal imaging cameras are used to locate radiant heat tubes in conjunction with ground penetrating radar, the customer receives a comprehensive service. GPRS offers both commercial and residential radiant heat locating services often with next day appointments. 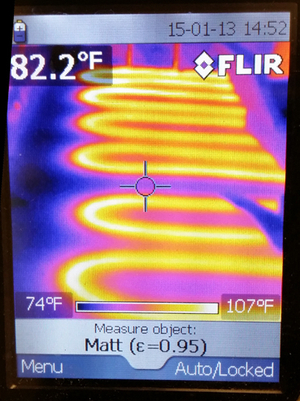 Our infrared cameras detect differentiating thermal patterns of buried heating pipes to pinpoint the exact piping locations and map radiant heat locations. 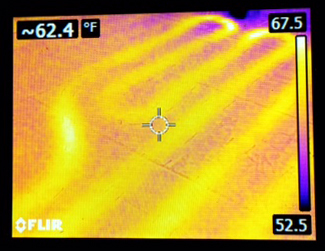 Thermal imaging and concrete imaging paired together gives the customer the best shot at locating all obstructions prior to core drilling. 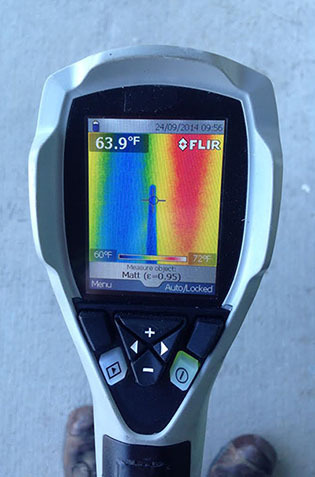 By using specialized detection devices that measure thermal radiant patterns, major temperature differences can be easily seen through thermal scanning devices. Whether it is your home, business, industrial facility or construction site thermal imaging is essential to avoid potential damage. Safety is a top priority at GPRS. All of our project managers receive extensive on-site training, attend the GPRS Training School, and complete OHSA 10-hour construction training. After completing the training course, new project managers ride with senior project managers to observe each application and learn the job. The senior project manager acts in a supervisory role as the project managers hone their skills and prepare to enter the field full-time. Fast Service avaliable to California, Colorado, Idaho, New Mexico, Nevada, and Utah. Contact GPRS today to schedule an appointment.